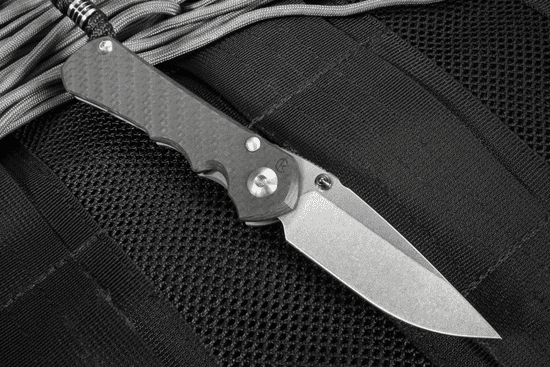 The Chris Reeve Small Inkosi is an everyday carry folding knife with a blade length of 2.75 inches that has many of the features of the Large Inkosi. Designed to further push the qualities and advantages of the Integral Lock system, the Inkosi is a new family of folding knives from Chris Reeve that will claim the "chief" position alongside the iconic Sebenza. Inkosi is the Zulu word for Chief, which is appropriate for a knife of this caliber. The carbon fiber Inkosi knife is made with production level precision and handmade care at their Boise, Idaho facilities and is only available at KnifeArt. This Inkosi folding knife has a closed size of 3.75 inches and a weight of 2.3 oz., giving it the compact size and light weight for everyday pocket carry. Both traits are ideal for knives in the sub 3-inch blade size range. The CRK Small Inkosi features an all-purpose drop-point blade shape, giving it a strong, controllable point and large cutting edge. The blade has razor sharp "Large Hollow Grinds", a grind that blends the best of hollow and flat grinds. The blade stock is 8 percent thicker (coming in at .0.128") than the similarly sized Small Sebenza 21, giving it an uncommon strength for this blade length. The CRK team selected American-made S35VN steel from Crucible Industries, which is an upgraded version of their popular S30V. This fine grain steel has a scratch-hiding stonewashed finish and is heat treated to a Rockwell hardness of RC 59-60 for toughness, high edge retention and improved sharpening ease. Our exclusive model of the small Inkosi has a weave carbon fiber handle on the front and a full titanium Integral Lock on the locking side. This reduces the weight significantly without compromising on strength. 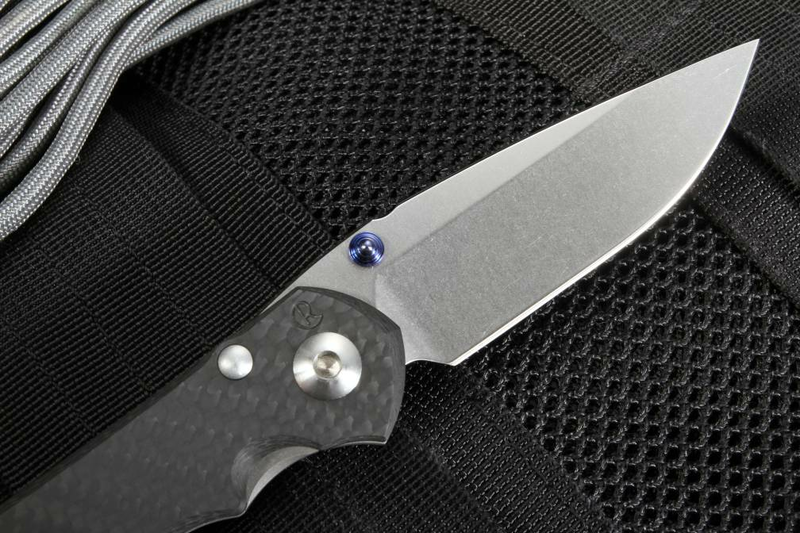 Carbon fiber knives are known for their tremendous strength - and the Carbon Fiber Inkosi is bank vault solid. This is a knife that really needs to be held to be appreciated. It is lighter in the hand than other knives, yet the carbon fiber is incredibly rigid and true. Chris Reeve Knives fully machines and laps the textured carbon fiber scales to make sure the tolerances are up to their high standards and provides an excellent grip. 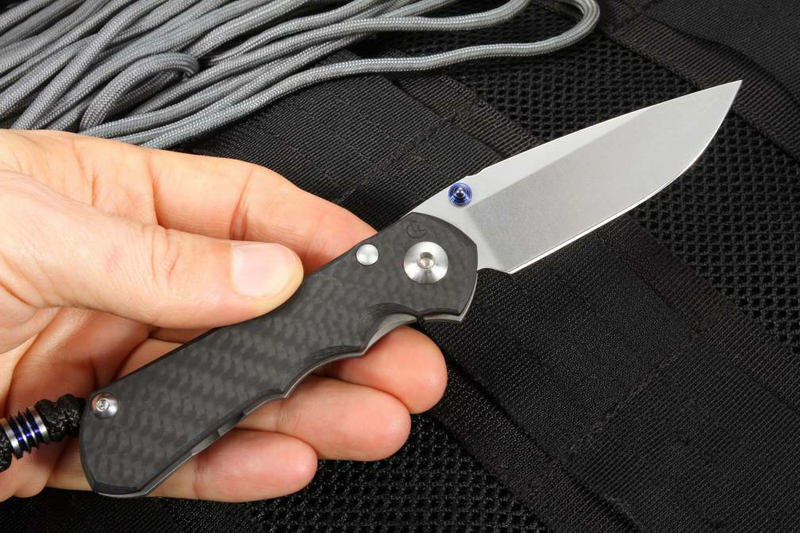 The carbon fiber knife weave is also aesthetically pleasing and will catch the eye of admirers. The Chris Reeve Inkosi has oversized phosphor bronze washer bushings that are sized identically on both the lock and handle size. This pivot construction with a stout coupling brings additional stability to the blade and allows the washers to hold lubricant to reduce opening friction. This knife has a 1/8-inch ceramic ball that acts as the interface between the lock bar and the blade. It also drops into the detent when closed to ensure the blade stays in place. The ceramic lock interface provides the user with a greatly increased lock life. The Chris Reeve Inkosi has a sturdy heat-treated stainless steel stop pin that will handle the rigors of opening and use. Refined design and precision construction are all part of this American-made pocket knife. The Inkosi folding knife features dual ambidextrous thumb studs, allowing the user to easily open the knife with either hand. 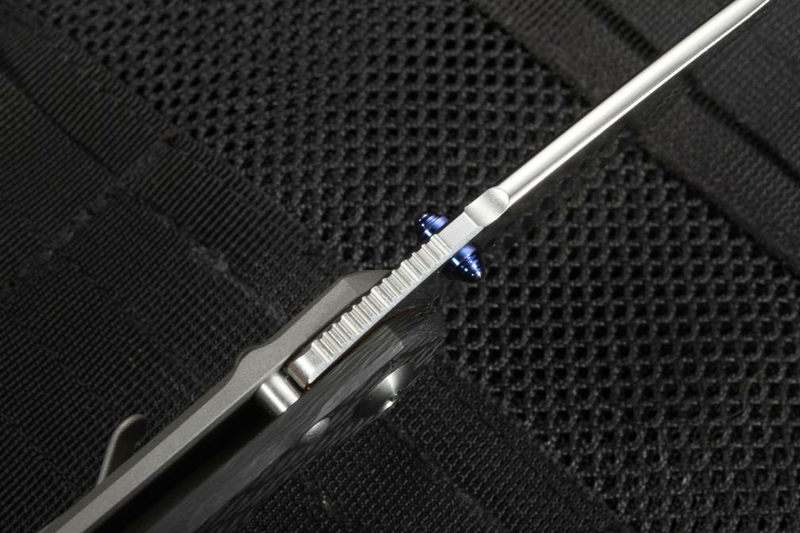 The thumb studs are made of their blue anodized titanium, providing the accents CRK is known for. 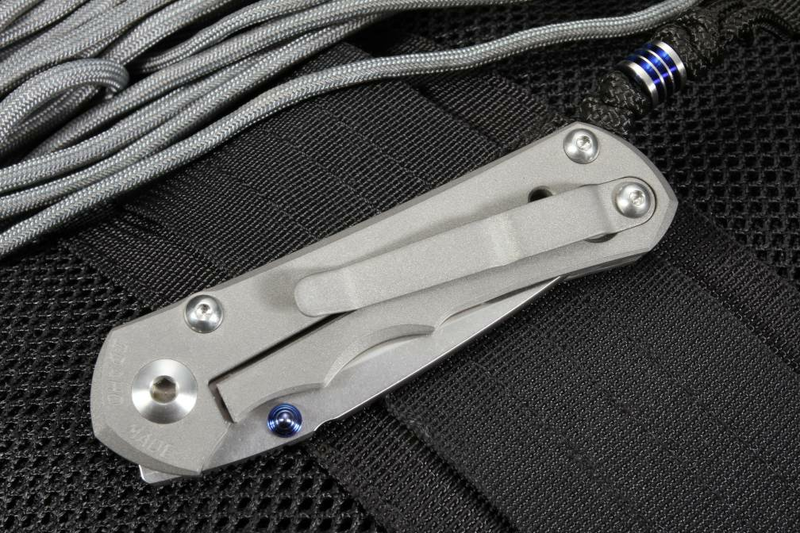 The carbon fiber Inkosi comes with a hand-tied black cord lanyard that allows easy removal of the knife from your pocket along with a machined titanium bead. This small Inkosi knife has a blasted titanium pocket clip that is mounted for tip-up carry and angled in a manner that allows the clip to rest on the handle, which keeps pressure off the lock and lock bar. The Inkosi comes with hex tools for disassembly and cleaning, Loctite, CRK fluorinated grease and a chamois cloth. KnifeArt has a satisfaction guarantee and fast shipping on this exclusive folding knife and Chris Reeve Knives backs it with a lifetime material and craftsmanship warranty. KnifeArt.com is proud to offer and represent the Chris Reeve Inkosi as an authorized dealer. Included with Knife: Hex tools, Loctite, attached lanyard/bead, CRK lubricant, certificate/paperwork, CRK chamois and packaging.